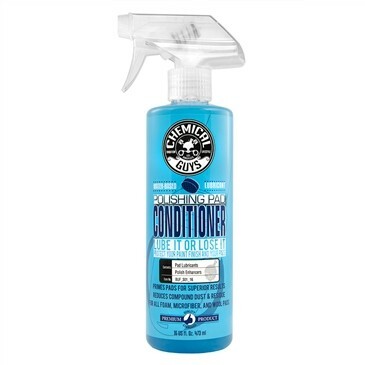 Foam Pad Conditioner-Prevention of dry buffing is as easy as misting an unused pad with Chemical Guys Polishing Pad Conditioner. Just a few spritzes is all you need to prep the pad for polishing. Chemical Guys Polishing Pad Conditioner lubricates buffing and polishing pads to reduce wear and tear, and produce superior polishing results. Dry rubbing builds up excess heat and friction, which reduces the effectiveness of polish abrasives and wears down buffing pads prematurely. The slick lubricants in Polishing Pad Conditioner extend work time of polish abrasives to produce refined results with fewer passes. Particle abrasives inside polish need a prescribed amount of time to break down and refine the finish as they work. Without the proper lubrication of Polishing Pad Conditioner, water-based compounds can dry out and spread all over the work area in the form of an abrasive dust. Synthetic conditioners open up porous polishing pad foam to evenly spread compound and polish around the pad for consistent cutting power. The combination of proper work time, reduced dry friction, and even breakdown of abrasives and residue control produces superior polishing results in fewer passes and less time on the job. Use Polishing Pad Conditioner on every polishing job for the best results.